We’ve all been feeling a lot of anxiety and uncertainty during this election season. Amidst this uncertainty, the Probate and Family Court has issued two new forms to make the beginning of a Massachusetts divorce case, at least, a little bit less uncertain. Effective immediately, parties who are served with or accept summons on a Complaint for Divorce can respond on the court’s new Answer and Counterclaim forms. In Massachusetts parties can file a Joint Petition for Divorce or a Complaint for Divorce. We encourage couples to first consider Mediation and Collaborative options, which typically lead to a Joint Petition filing. However, sometimes there are emergency issues or protective issues that require the filing of a Complaint for Divorce to get a court process started. Or, as we see too often, someone who wasn't informed about their other options files a Complaint because they believe that is the only option, and now their spouse is faced with the question of how to respond. The Complaint for Divorce and Joint Petition forms are available on the court's website. Under the court rules, after someone files a complaint (the "Plaintiff"), they receive a document called a summons. The Plaintiff is then required to serve the summons on the other party (service can be by constable or accepted by signing in front of a notary). The summons indicates the name and address that the "Defendant" needs to send their Answer and/or Counterclaim to. 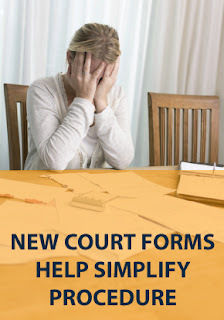 After the Defendant is served with (or accepts service of) the complaint and summons, they are required to file a document called an Answer with the court within 20 days. The Answer responds to each of the numbered paragraphs in the original Complaint for Divorce. It is basically a place where they can confirm for the court basic facts of the case like a) their name and address, b) where they were married, c) when they were married, d) their children’s names and ages, and e) the kinds of relief they're asking the court for in their final divorce (which are generally the same in almost every case – a division of property, a judgment of divorce, a parenting schedule, child support, health insurance, etc.). It is unlikely that a Defendant would be penalized if they forget to send an Answer, but it is good form to always submit an Answer. It tells the court that they intend to participate in the divorce proceedings and will protect against their spouse trying to seek relief from the court without their knowledge. After someone is served with (or accepts service of) the complaint and summons, the Defendant also has the option to file a document called a Counterclaim for Divorce with the court. The Counterclaim is basically another form of a Complaint for Divorce. When the Defendant files a Counterclaim, they are telling the court and their spouse that they are also seeking this divorce, and they also believe the marriage is over. This is not a required document either, but can be helpful in notifying the court of the Defendant's intentions. Until recently, both the Answer and the Counterclaim were documents that a party or attorney had to prepare on their own. The court has now simplified matters by creating standardized versions of both these documents. If attorneys still want to prepare their own Answer and Counterclaim documents, they are still free to do so. In terms of format, the Counterclaim closely mirrors the Complaint form, and the Answer for, clearly sets out in numbered paragraphs each section of the Complaint that the Answer is intended to respond to. If the Plaintiff receives a Counterclaim they should also file an Answer to the Counterclaim. Most attorneys will advise that the Answer and a Counterclaim in a Massachusetts Divorce are really procedural documents that don’t in most cases make a substantive difference to your case. They are just a place for the Defendant to acknowledge dates and addresses (or correct them), to make sure that they get entered into the system correctly. The benefit of having a standard form Answer and Counterclaim is that this puts the acknowledgment of these dates and addresses in a clear, neutral and less “loaded” format. We have had clients who have unnecessarily felt stress or concern when receiving their spouse’s Answer or Counterclaim, because they didn’t understand that this was just a standard form response. The neutral format makes the Answer and Counterclaim look like what it is – just a form with factual allegations, rather than a finely-crafted document full of legal arguments. In addition, it’s a format that is easier for pro-se litigants, without attorneys, to understand. We applaud the efforts of the Massachusetts Probate and Family Court to simplify the procedure of divorce, so that families can concentrate on the more important issues in the their case. For more information, you can read the court’s Q&A about the Answer form here.